The Quinnipiac Bobcats (0-2-0, 0-0-0 Eastern College Athletic Conference) dropped their opening series with No. 7 Ohio State University Buckeyes (2-0-0, 0-0-0 Western Collegiate Hockey Association) this weekend losing by a score of 3-2. Quinnipiac opened their season last night as they fell 3-2 to the Buckeyes in a very competitive game that was highlighted by the offense of both teams. The Bobcats had numerous chances but were unable to convert and were held off by the Buckeyes, who handed them their first loss of the season. This afternoon’s contest picked up right where both teams left off as the first period was filled with back and forth action. The Buckeyes wasted no time as just a minute into the game they began peppering Allison Small with shots, and fortunately for the Bobcats, she was up to the task. However, it wouldn’t take long before Quinnipiac found themselves establishing some pressure of their own. Two Ohio State penalties sent them to a 5-on-3 power play which was highlighted by a Katie Tabin shot from the point that made it through everyone but Buckeyes goaltender Amanda Zeglen who was able to make the save. The remainder of the period saw much of the same as both teams were clicking on offense. Ohio State began to gain some momentum late in the period as they were giving Quinnipiac a lot of trouble on the breakout and were able to keep the puck in front of Allison Small and the Quinnipiac defense. Fortunately for Quinnipiac, Small was outstanding in the crease, saving all ten shots she faced and keeping the game tied as the teams headed to the locker-room locked in a scoreless draw. 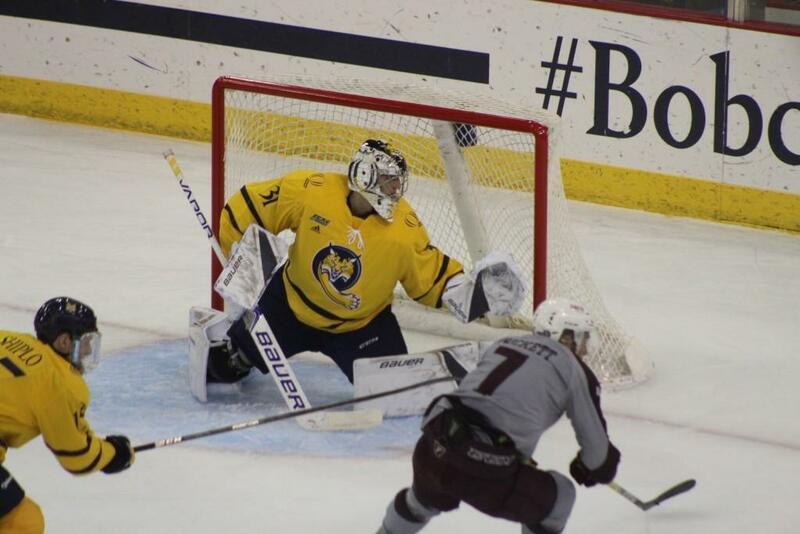 The second period began very similar to how the first ended – Ohio State continued to push the pace and found themselves in their offensive zone, but Allison Small continued to make save after save for Quinnipiac. The Buckeyes’ offensive barrage continued and they could not be stopped as Olivia Soares broke open the scoring as she found herself in front of the net and rang a shot off the back crossbar to give Ohio State a 1-0 lead with 15 minutes left in the period. Just five minutes later, Melissa Samoskevich rang the post on a breakaway, and as Ohio State came back down the ice, it appeared they would extend their lead to two on a rebound, but the goal was overturned due to goalie interference on Allison Small. Shortly after, Samoskevich tipped a puck past the Buckeyes defense and found herself on another breakaway. This time she was able to redeem herself as the Bobcats captain lifted the puck over the shoulder of Amanda Zeglen to tie the game at 1. It seemed like the momentum was finally starting to swing towards Quinnipiac when a bad breakout left Tatum Skaggs all alone with only one defender to beat. She did just that, as she spun and fired a shot towards goal that went through the five-hole and broke the tie, giving Ohio State the lead right back. Ohio State continued to control the puck, but Allison Small kept making saves and the sides headed to the third period with the Bobcats trailing 2-1. Similar to Friday night, it was the Buckeyes who struck first in the third period to extend their lead. Olivia Konigson took an early penalty for Quinnipiac and Ohio State was able to capitalize. Skagg’s second goal of the game came on a shot that went wide but was collected and slid past Small on the wrap-around. The Bobcats would not go away quietly, though, as Melissa Samoskevich would find the back of the net once again to bring the Bobcats within a goal. Quinnipiac would have one last chance to make something happen as they went on the power play with just about 4 minutes remaining. Unfortunately, they were unable to create any offense and the game would end in another disappointing 3-2 loss for the Bobcats. Despite two losses to start the season, Quinnipiac head coach Cassandra Turner feels really good about where her team is at. Quinnipiac will continue their season this Friday at 6 p.m. when the University of Maine Black Bears (1-0-0, 0-0-0 Hockey East) will be in Hamden for a two-game series. The Black Bears opened their season with a 7-0 win against the University of New Brunswick and will look to continue their winning streak.